Welcome to the Choosy Epicurean! This blog is to share the finer things in life. I hope for it to be interactive in which people will share their favorite wine, cheese, chocolate, port, coffee and more. Please join in :) I've opened the blog by posting one of my favorite new finds, a sparkling Shiraz in which a good friend recently introduced me to. 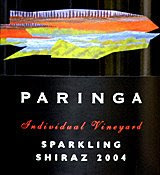 If you want to surprise somebody with something new this is a good bet, the 2004 Paringa Sparkling Shiraz! It's quite delicious and a fun experience.